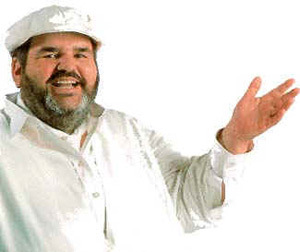 In 1979, when Chef Paul Prudhomme and his late wife, K, opened their unpretentious, 62-seat K-Paul's Louisiana Kitchen in New Orleans' historic French Quarter, they had no idea the restaurant was soon to become a world sensation. Most importantly, Mr. Prudhomme put on the map his own personal blend of Cajun and Creole culinary delights, which he simply called Louisiana cooking. With Mardi Gras around the corner, who else but Chef Paul Prudhomme could be the definitive source for a traditional Cajun Gumbo. 3 cups smoked ham cut into “sticks” about 1-inch long and ½ inch wide (a ham known as tasso, a New Orleans specialty, is best for this. 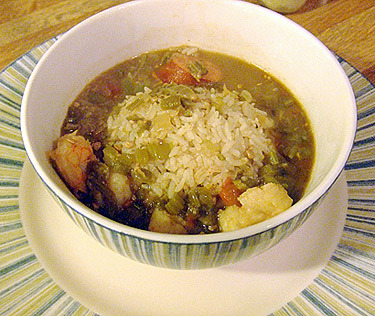 If you wish to make a Creole gumbo, do not use a heavily-smoked ham. A heavy, black, iron skillet is almost essential for the preparation of this dish. 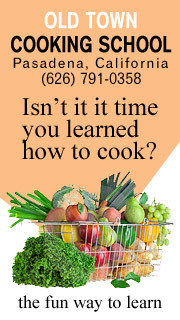 It is also strongly recommended that all the ingredients be chopped and assembled before starting to cook. Combine and assemble them in the order in which they will be used so they may be added without hesitation. Heat one-half cup of the melted lard or oil in the skillet until it is barely smoking. Add the flour and stir vigorously and constantly with a wire whisk about three minutes or until the mixture is the color of dark chocolate. Take care that it does not burn. Quickly add half of the onions, one-half cup of the green peppers and one-half cup of the celery. Reduce the heat and cook, stirring, about three minutes. Add four small bay leaves or two large bay leaves, one teaspoon of cayenne pepper, one teaspoon white pepper, one-half teaspoon black pepper and cook, stirring, about one minute. Add one teaspoon of the minced garlic and cook briefly, stirring. Remove from the heat. Scrape the mixture into a large casserole and set aside. There should be about one-and-one-half cups. Heat the remaining one-half cup of melted lard or oil in a black iron skillet over very high heat. When it is hot and almost smoking, add the okra. Cook, stirring often, about 15 minutes. Frozen okra may require a shorter cooking time. Add the remaining onions, green peppers, celery and minced garlic, one cup of the ham and the remaining bay leaves. Continue cooking over high heat, stirring occasionally, for five minutes and add the remaining cayenne pepper, white pepper and black pepper, and the garlic powder. Add salt, if desired. The base of this gumbo before the seafood is added may be made several days in advance and refrigerated. It also may be frozen. When ready to serve, remove the bay leaves. Serve the file powder separately to be added by each guest according to taste. Serve with plain boiled or steamed rice.